The New Zealand made C-TUG Kayak and Canoe SandTrakz Cart is setting new standards with its sophisticated style and precision design. C-TUG SandTrakz is the best, most versatile and durable kayak cart on the market. It carries up to 170lbs (80kg), dismantles for easy stowing and won’t rust. When it comes to moving loads over soft sand, wider wheels are not necessarily better. Bulldozers and military tanks use long tracks, reducing the chance of them digging in. 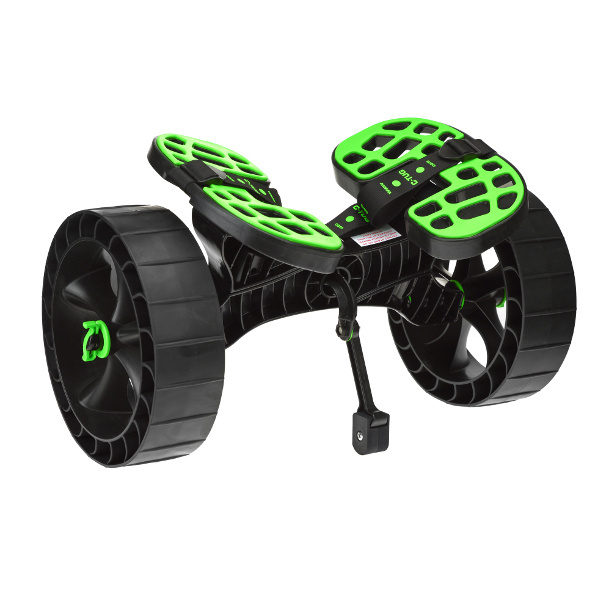 SandTrakz puncture free wheels mimic this track system. The outer rim compresses when in use giving a longer track length. On soft sand, this reduces how hard you have to pull to move your cart by more than half compared to standard puncture free Kiwi Wheels! In fact, the SandTrakz system is so effective we think it’s better than balloon wheels! Whilst they are designed to make life easier on soft surfaces, SandTrakz wheels are great on hard surfaces too! Because C-TUG SandTrakz is designed to compress they act like suspension on hard surfaces, making for easy transition from soft to hard surfaces. Patent pending, C-TUG SandTrakz Wheels are made in New Zealand.